If you’re looking for an easy way to use up those bags of orchard-picked apples from last weekend, this is it. This applesauce recipe is the simplest of the simple – a food processor/blender isn’t required and the apple skins don’t even have to be cut off. All you need is a pot and a fork. And unlike some store-bought applesauces this homemade version doesn’t have unnecessary amounts of sugar, making it a healthy snack option. Add cinnamon and a bit of honey for that classic childhood taste, or experiment with add-ins like dried cranberries, walnuts or granola. If you’re a serious applesauce fan, learn how to bake with it. 1. Rinse apples and cut each apple into wedges (8-10 per apple). 2. Cut wedges into small cubes and put into pot. 3. Add 1 cup of water and ½ teaspoon of cinnamon . 4. Cover pot and boil on medium heat for approximately 20 minutes. Stir occasionally. 5. For the last 10 minutes, lower the heat and stir more frequently. Use a fork or masher to mash up apples as they break down. 6. 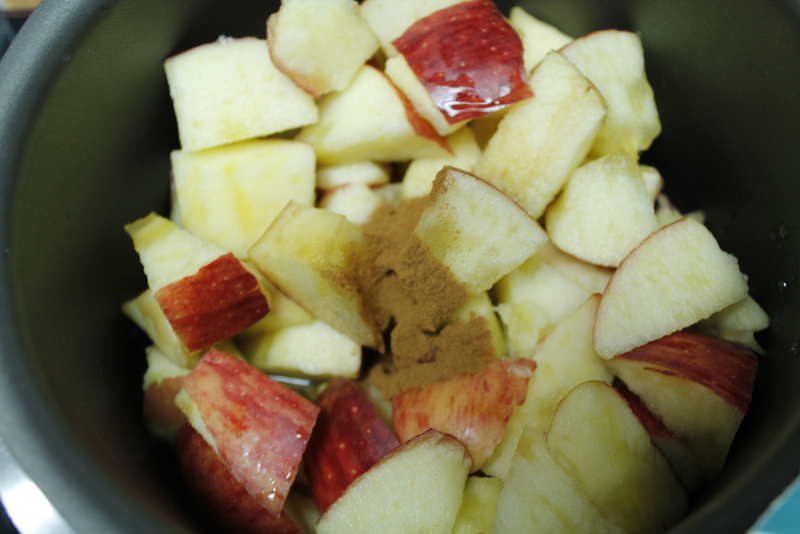 Add sugar, honey, or more cinnamon to taste.